Home winemakers use fining agents regularly to remove proteins, bitterness, astringency, and haze-forming compounds. As homebrewers, we often skip this last adjustment before packaging our beer. Maybe that’s because we’re so eager to get it into our bellies! But by employing one or more of these fining agents, we can give our brews a better chance at being haze-free. And besides how it looks, a lot of what causes cloudiness can also lead to staling, which is when a beer’s freshness is replaced by off flavors. With a few simple steps in no more than a week, an average-looking cloudy homebrew can be transformed into a brilliantly clear, stable, and attractive beer. The short answer is yeast, proteins, and a class of bitter/astringent compounds called polyphenols. Fining Agents target one of more of these haze producers. 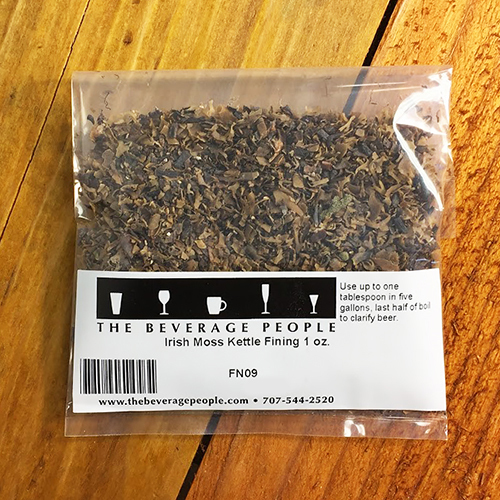 Probably the gateway fining agent for most homebrewers is Irish Moss. It is added to the kettle, 15-20 minutes before the boil is finished. It facilitates a strong cold break (resembling egg drop soup) during the wort chilling by attracting large proteins and forming clumps that settle to the bottom of the kettle, making them easy to leave behind when transferring wort to the fermentor. Irish Moss is a source of carrageenan from red seaweed. Premeasured tablets of purified caraggenan are readily available and make for a convenient method of addition. Two popular brands are Whirlfloc™ and Kick™. 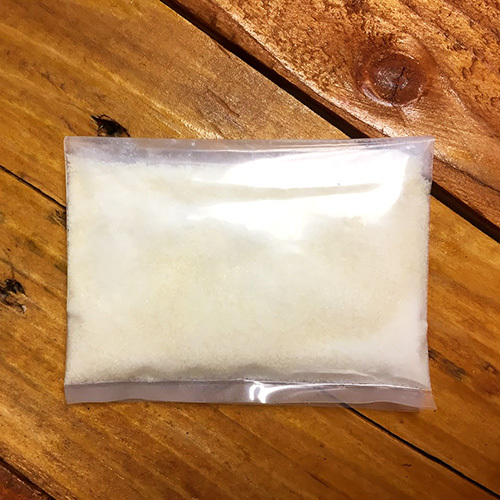 Irish moss and caraggenan-containing fining agents are not recommended for high adjunct or 100% malt extract recipes as they may deplete some essential nutrients (FAN) that the yeast need during fermentation. The remaining fining agents are used post-fermentation. This type of fining is often referred to as Stabilization. They are added to the secondary fermentor and then racked off the sediment before packaging. 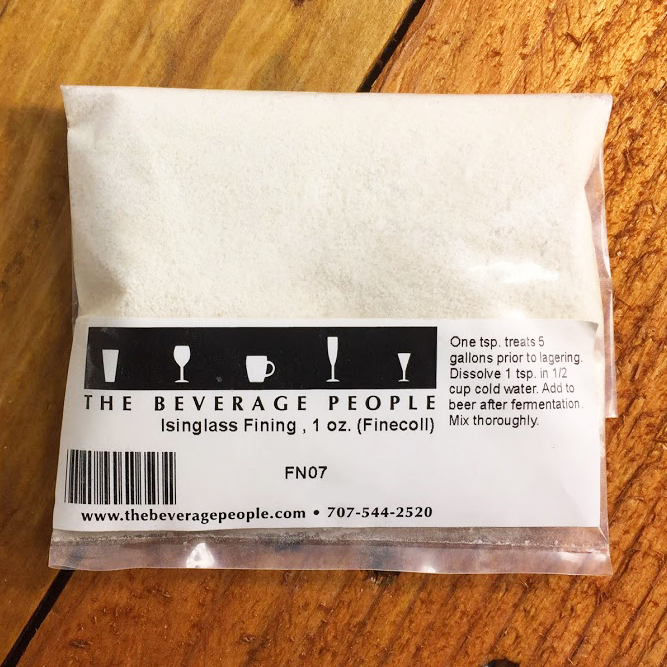 Isinglass and Gelatin are popular for their ability to remove yeast haze. Both are collagen-based forms of protein, derived from fish and hooved animals. As they are positively charged and have an affinity for phenolic compounds, they can also decrease astringency and lessen phenolic flavors in addition to settling out some protein. 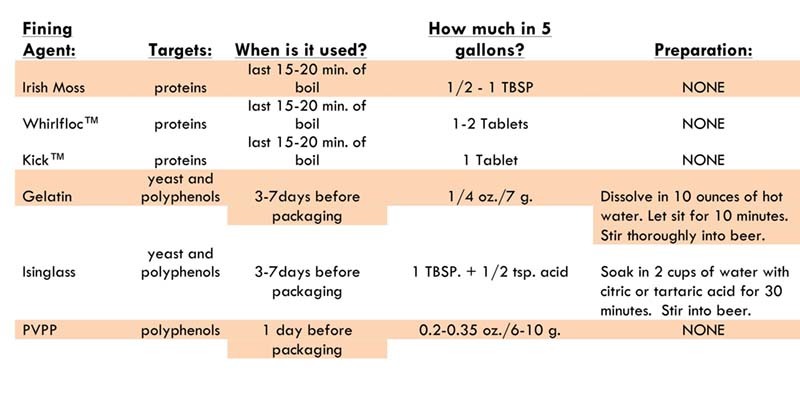 They are added 3-7 days prior to packaging, but require some preparation (See Beer Finings Chart at the end of the article). Crash cooling the fermentor before transferring always helps to compact the settlings, making them easy to leave behind. 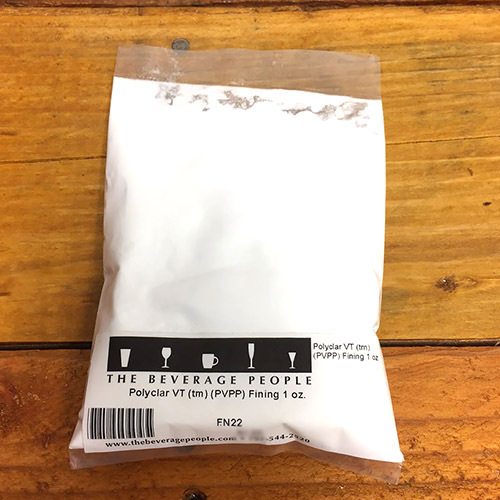 Polyvinylpolypyrrolidone, (lets call it PVPP for short!) 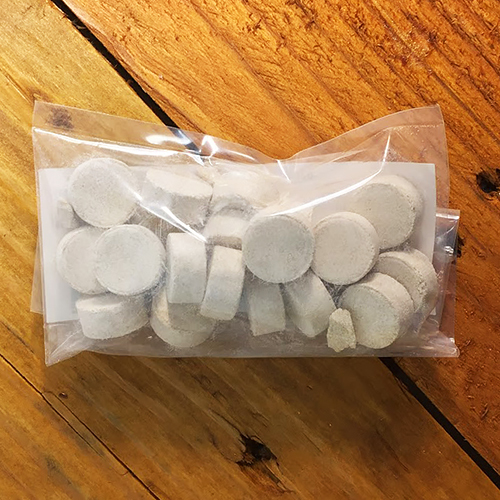 is a fluffy white plastic polymer powder with a high surface-area-to-volume ratio, which is effective at removing those astringent polyphenols produced by grains or hops. Like the Isinglass and Gelatin it is added to the secondary fermentor, but needs less than a day to work before transferring. 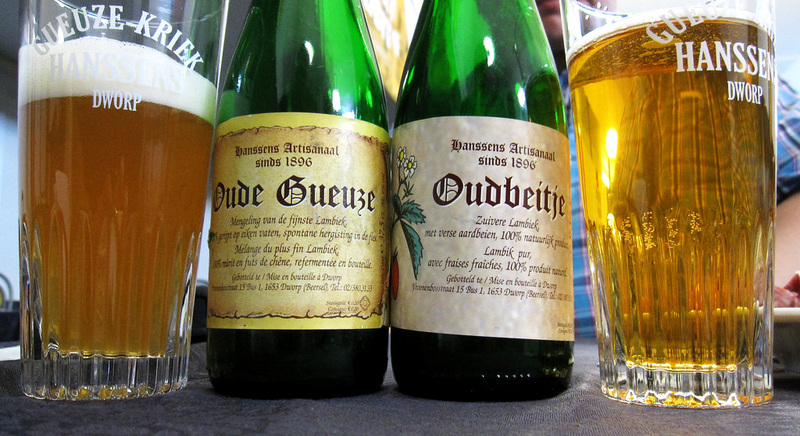 PVPP is insoluble in beer and it is common to use filtration to remove it after it has fined. These are just of few of the most popular fining agents used in beer. Filtering can also be done to improve clarity, but usually is not worth the trouble for batches smaller than ten gallons. Don’t forget that cold-crashing (moving the fermenter to a cold place) overnight prior to kegging can be really beneficial in dropping out yeast. It can still be done before bottle conditioning, but remember to transfer some yeast to the bottling vessel to ensure successful carbonation. Cheers to crystal clear beers!